The entire Youtube team needs to stop pretending they have a clue what they're doing, throw their keyboards away and just keep the servers running. That would be great. - Someone who is frustrated with Youtube's constant crippling of features and gushing fountain of bugs. They've changed it to annoy us .. there's no other reason. All big coorporations are SH*T and YouTube is going for the top! You can't have anything that just works .. cause the devs. are brain dead. The devs. 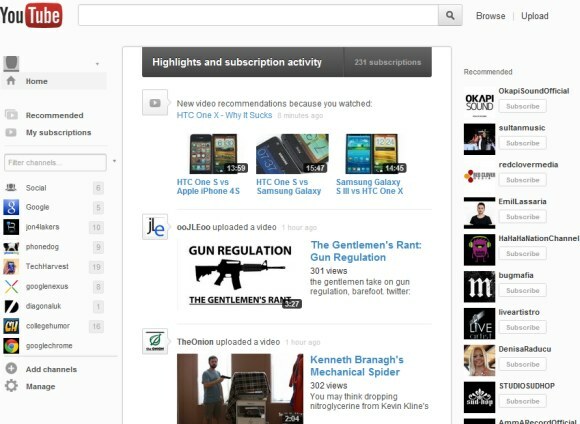 at YouTube are brain dead .. and no one noticed this, just the users of YouTube .. They really can't do something that .. just works .. they are simply incompetents. Hmm... 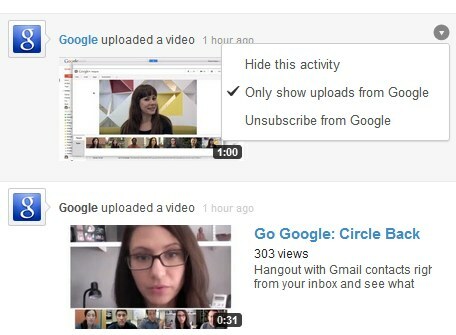 Does this mean that now there isn't a way to only show uploads from users? I can't find the Only show uploads button. Looks like it's now a per user setting. I think I might go back to the current version. this is really cool, this why i love youtube more than other video channel. Sadly it was just an experiment. I think it was an improvement that I would like too see again soon. This change looks to have been forced on me 8/16/2012. I hate it. I do NOT want to see recommendations in my main view. I only want to see NEW VIDEO UPLOADS from my subscriptions in my main view. This business of having to click every subscription to check a box for showing uploads only is bull crap. What happened to the single check box to show uploads only from ALL subscriptions. 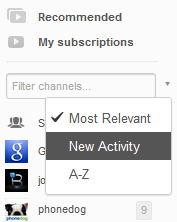 I also NEVER want to see google+ activity in my youtube home page. Please Youtube team, back away from the keyboards. Indeed, this pisses me off too, what's all the more frustrating is that it seems to only have been forced on some people, AND HOW IS REMOVING FEATURES CONSIDERED AN UPDATE! I use youtube to see videos that my subscriptions UPLOAD, not every single damn little thing they do. Não gostei, o design é feio e o You Tube esta cada vez mais sem utilidade, esta perdendo o foco que é o compartilhamento de vídeos e não de canais. O You Tube esta otimo atualmente, pra que destruir o que esta perfeito, o que o You Tube precisa investir é em recursos visuais, como temas para canais, melhores opções para as listas de reprodução, etc. ever since google took over youtube,it's been a continuous downhill slide,and the way it's going, it's going to be in the sewer in a year or so.They keep changing it,and when you think theres no way they can make it any worse,they figure out a way.The homepage is completely stupid,you can't find anything,it feels like half page the is missing,even the previos homepage didn't function properly.Their trying to take the YOU out of youtube,it's all about money and their best interest, they don't give a crap about what you and I think.GREED GREED AND MORE GREED THAT'S ALL THEY KNOW...WHAT A JOKE .Google or youtube need to take all these designers or what ever you want to call them and flush them down the toilet.Start fresh,go back 2 year and start from that platform, and quit ignoring the comments of youtube users FRIGGEN MORONS!!!!!!!!!!!!!!!!!!!! !